Best of the Week: 8K TV broadcasts, Monitor Audio Bronze 2 review and more | What Hi-Fi? This week Japanese broadcasting company NHK conducted a successful live test of 8K footage, Dolby Cinema received a boost with a number of films set to come out in the new format and Samsung launched a pair of tablets. 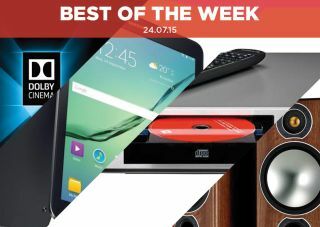 On the reviews front, it was another solid week with a sterling effort from Cambridge and its CXC CD Transport, Sony's KDL-55W805C Full HD TV and Monitor Audio's terrific Bronze 2 budget loudspeaker. Never heard of Dolby Cinema? It's the the company's latest attempt at improving the cinema experience, this time through combining its Atmos surround sound and Vision picture technology together for what it claims is a "completely captivating experience". Hollywood studios are lining up to embrace Dolby Cinema, with Sony's Pixels, Paramount's Mission: Impossible - Rogue Nation, Universal's Everest and Lionsgate's The Hunger Games: Mockingjay - Part 2 all set to appear in the format this year. The only problem is there are currently no Dolby Cinemas in the UK and relatively few worldwide. If you want to sample the future of cinema, Eindhoven or Barcelona would appear to be your best bets. We've barely got 4K pipelines up and running but The Japan Broadcasting Corporation, NHK, is already pressing ahead with 8K, with the aim of broadcasting in the format by 2020. An 8K broadcast from the Yankee Stadium in New York was successfully carried out last weekend, delivering a full weekend of baseball in 8K. Samsung has announced a new range of tablets with the Tab S2. The Korean company claims its Tab S2 range will be the thinnest and lightest tablets in the world, with the 9.7in and 8in models featuring 2048 x 1536 resolution and octacore processors. The tablets go on sale in August, but there's no word on price yet. "Once up and running these Monitor Audios are hugely talented performers"
The Bronze 2s are the latest generation of a range that's been around for 15 years, and the results of Monitor Audio's recent upgrades are spectacular. Offering plenty of detail and insight, the Bronze 2s excel at communicating the intricacies of a track, whether it's articulating the dynamic highs and lows or its confidence with bass, these are supreme performers. Don't hesitate to give them a try. "And if you’ve already got a good DAC, we would not hesitate to recommend the CXC over a standalone CD player to link to it"
Cambridge's CX range of hi-fi products received glowing reviews from us for its stereo amplifier and its music streamer. The CXC keeps the run going with another, almost flawless effort. The precision and subtlety the CXC offers is impressive, the performance more expressive than CD players at the same price. But you'll need to pair it with a good DAC, raising the overall price of your system. If that's not a problem, then the CXC is a player that's well worth the asking price. "The KDL-55W805C may not be perfect, but it’s an engaging, inviting screen that is well worth a look"
With 4K TVs becoming an attractive proposition, the trusty old Full HD is feeling a little overlooked. Sony attempts to redress the balance with its KDL-55W805C. And it does well. Picture-wise, it's crisp and glossy with colours that pop. There's the standard complement of Netflix and Amazon Prime Instant but the 55W805C also packs in Sony's Android TV, with supports for Google Cast and the Google Play Store. Where performance dips is in the broadcast of standard def images with plenty of noise lingering about. Otherwise this is a fine TV.